The Neoliberal Economic experiment has failed. The Global Financial Collapse is really the only evidence we need. But why are we failing to move on politically? Unfortunately the political parties formed around conducting this experiment are extremely large and well financed. We have allowed them to take up a position in the public narrative as ‘good economic managers’. Parties such as the Liberals in Australia, the Republicans in America and the Tories in the UK have been playing economics by a rulebook – Capitalism and Freedom – written by the economist Milton Friedman at the Chicago School of Economics in 1962.
privatisation (sale of public assets and services). Its main justifications were that government-run institutions are inherently inefficient and wasteful, that government employees are not motivated to provide the best service for their clients, and that corporations are inherently driven to compete, thereby ‘the market’ will penalise them for being inefficient. 1. Corporations that are allowed to run government inherently act in their own best interest – to increase profits, not in the interest of people. 2. Corporations with this power also act against corporations that don’t have ‘the ear of government’ – this results in an increase in anti-competitive monopolies that have no competition. The results are clear to see. Removal of regulations in the US led to monopolistic financial institutions lending vast sums of money in a greedy race for interest. The result has been the biggest public bail-outs the world has ever seen and a global collapse in market confidence unprecedented even by the great depression. Australia under Kevin Rudd and Wayne Swan managed to steer away from this plummet in confidence by a swift and targeted government spending package. This action was supported by the antithesis to Friedman’s ‘free-market’ model – the economic model of John Maynard Keynes. This action was singular in the world, as most governments were trying to shut the gate after the horse had bolted – dictating ‘austerity’ or a decrease in all government spending. In Europe this has been especially devastating. Greece, Spain, Italy and Ireland have been the worst affected, and Germany has had to take the reins of their economies to avoid a complete collapse of the Euro. Somehow the Labor party in Australia has allowed these events to slide out of public view. By buying into a media war with Liberals over a concocted soap opera of leadership struggles and a ridiculous racially-fuelled fear that we are about to be swamped with rich queue-jumping ‘boat people’ Labor has allowed the public narrative to slide into a dumb abyss. We cannot allow the hard work of generations of unionists to disappear overnight. The Labor party must join with the Greens to reinstate a rational public narrative; in spite of Rupert Murdoch. 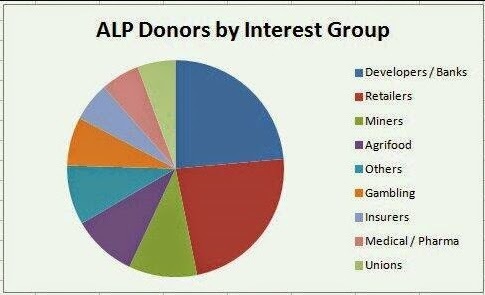 For this there is one main barrier; Labor is supported financially by corporations with a greater say than it’s own members and unions in how the party platform will be implemented when in government. What promises are made publicly before an election are restricted by pandering to these donors. We have even seen a popular elected Prime Minister removed from office for trying to implement a reasonable tax on mining companies. These are dangerous times for Labor, and therefore for the Australian people. Our own economic collapse is not far away if we do not diversify our economy. Pandering to the most vocal, greedy and monopolistic mining corporations (supported by the banks, developers and insurers) can no longer be the role of Labor. A great divorce must take place. There is a benefit to this taking place. The Liberals are standing on one leg. The only thing they stand for is protecting the corporate interests of a few. The only card they can play is bombarding the public with advertisements. Allow them to play that card. Reintroduce the original robust mining tax as the MAIN way of diversifying and saving our economy. Let them spend every cent they have at their disposal driving the general public up the proverbial wall with negative advertising. And go viral with your own message. We will support you.